No warnings are forceful enough to help you now. Sometimes, the Big Boss gives me hell, sometimes he puts me through hell (not really). This time though, he sent me and a group of my (fictitious and animated) friends to establish a settlement in a place where the Gates of Hell have opened! It’s the demon apocalypse and we’re supposed to find a way to not only survive it, but thrive in it as well. No holds barred, either: he told me to use dark magic, black magic and any kind of occultish things necessary to accomplish this task. My first thought was ‘Oh, thanks a lot, this’ll be fun.’ In fact, it is — it’s an indescribable blast — but I will try to hit some of the high points. Judgment: Apocalypse Survival Simulation is a real-time colony builder and simulation in which four people start out trying to survive the demon apocalypse. Unfortunately, one of them dies before your attempt even begins, so actually, there are only three of you. Poor Ned. Poor little Ned (we’re only assuming he was small since we never got to see him). Once you pick your difficulty level, you start out by rolling your characters. Since this was my first foray, I just went with the three people who were dealt, then adjusted the name of the fighter to my own. After that, I altered all of their clothes. These are all cosmetic traits which are quite easily changed; none of these features altered their characteristics in any way. In fact, you can’t change their attributes at all — you would have to re-roll an entirely different person to do so. If you’re playing with the tutorial enabled, as I did for this, then everything is eloquently explained and easy to understand. Judgment: Apocalypse never throws anything at you that you can’t handle (initially). It eases you into each aspect of gameplay. However, it doesn’t spoon-feed you every tiny morsel of pertinent information, either. Even in tutorial mode, it’s not about spoiling everything each step of the way (and I will try not to spoil anything). Your first mission is actually four-fold. You need to access the toolbar at the top to figure out exactly what’s going on. It probably even tells you to do that. Fortunately, the first time you open each tab, it goes into great detail about what exactly is going on underneath (unlike some of the Underworld un-beings you might un-encounter later… un). Especially user-friendly is the fact that the key commands are printed on these tabs for even easier access once you somewhat get the hang of what’s happening. It’s not un-cool — in fact, it’s very cool (unlike the demons lurking around the corner wanting to… well, you get the idea). Obviously, some of it is pure common sense as well. If it’s colored, you can craft, build, research it, etc. — if it’s grayed out, you can’t. When you hover over whatever it is you need, it lists everything required — anything missing is red. We better get to work! There is such a wide and varied range of buffs, debuffs, attributes and all-around strange things happening which affect your colonists — the list would be both huge and amazing. Half the fun is discovering all the weirdness of your people as well as the enemies, things that are just not normally found in other games. We’re glad we got a new, healthy engineer — however, it might be too bad she’s a coward, an addict and an alien abductee. From the economic efficiency of your group to the enemy’s awareness of your colony, the fact that all these features are thrown into raw number calculations can make for some nerve-racking circumstances. The bad guys slowly become more aware of your presence in the world, as well. There’s a lot to keep track of, but it’s all very straightforward. Again, we’re at the beginning. Everything I have mentioned so far about Judgment: Apocalypse goes on at your home base. Granted, I was (literally ignorantly) a little disappointed when I saw the size of my first/home/starting map. However, this is only a tiny portion of the vast amount of randomly generated mania that exists outside your wee and piddly domicile. After clicking on the globe icon in the top row (or the M key), simply click on the markers to see what is in store for your team when you venture out onto the main map. Yes, you do eventually have to leave the safety of your happy little colony. Provided you survive any attacks to your settlement proper, you can take some (or all) of your people out into the gigantic, unexplored world. Create a task force, probably of your best fighters and magic-slingers, then leave the rest behind to tend to the colony’s needs if you want. If you’re stocked-up and comfortable leaving your settlement unguarded, go ahead — take all of them out for an adventure. Stop bugging us, Martha. We’re not stopping at the werewolf-guarded Pentagram Restaurant that’s currently on fire. 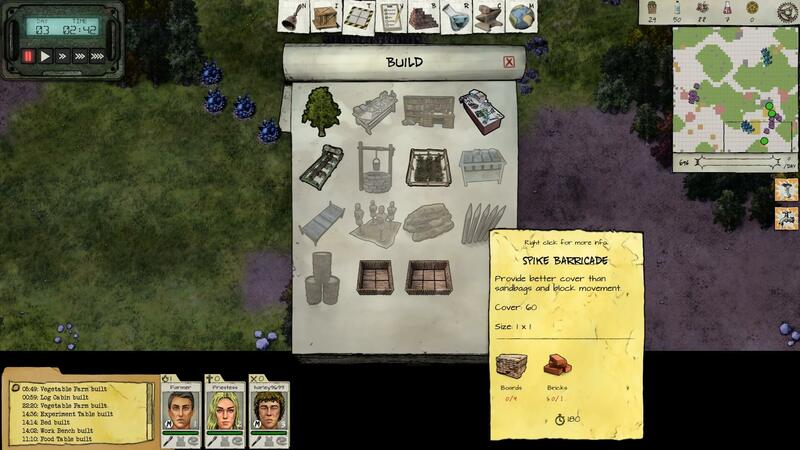 Besides all of your outpost’s needs (supplies, building, crafting, etc.) you have to go out hunting various other items to help you grow. What else could Judgment: Apocalypse possibly add to make this management even more fun? Why, tactical combat, of course! Having briefly, previously mentioned attacks at your base, tactics are of vital importance when you venture out as well. Make sure to use cover and flanking to your advantage. Get out of the open, Stan, ya moron. Meh, a Fire Imp. We can take him. Oops, a Minor Demon. First time with one of those. We're getting hurt and there's a different one! The final point I will only briefly touch upon are the rituals. There is research — then there is Occult Research. These are two very different entities. 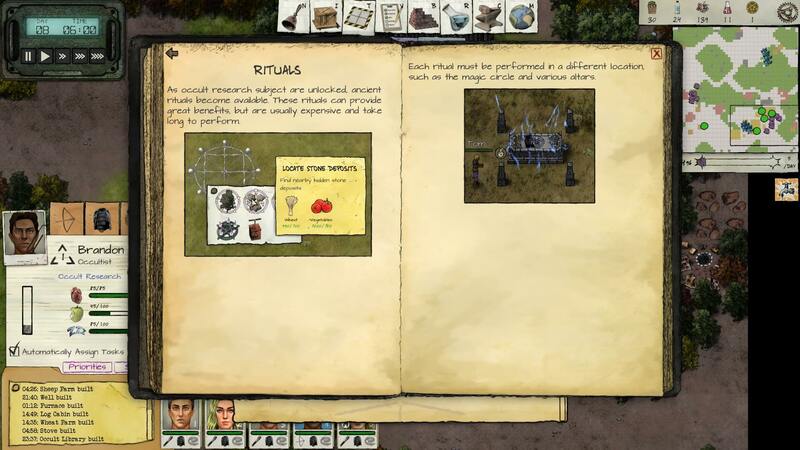 Occult Research lets you carry out crazy rituals, summoning, altar building (I so wanted to say build an Altar Bridge there, but alas) and an enormous variety of Black Magic and Dark Arts. I would think it to be extremely spoilery to go into much depth with the occult aspects of Judgment: Apocalypse. Did I mention it was still in Early Access? No — but unbelievably, it is. It’s incredible that there is so much quantity and quality of fun in a game that’s not even released yet. Even now, it would be infinitely replayable. All of the weird, random events that happen are highly enjoyable. There are many devices I didn’t even mention. In case you can’t tell, I absolutely love this game and can’t wait to get back into it. 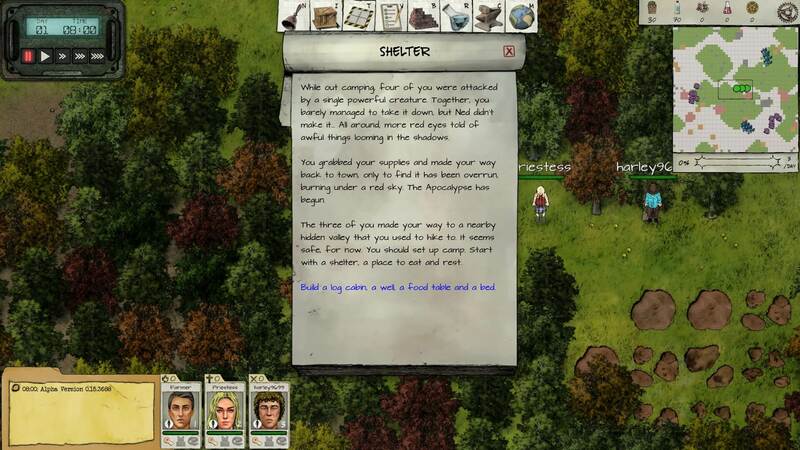 The hardest part of this review was getting away from Judgment: Apocalypse Survival Simulation long enough to write about it. Judgment: Apocalypse Survival Simulation is available now on Humble Bundle (where it’s currently 24% off) and Steam. Should we play Challenging or Tough? The body doesn't do anything, but the attention to detail is great! Plus, it just looks cool. More general information. Info's everywhere and easy to find.